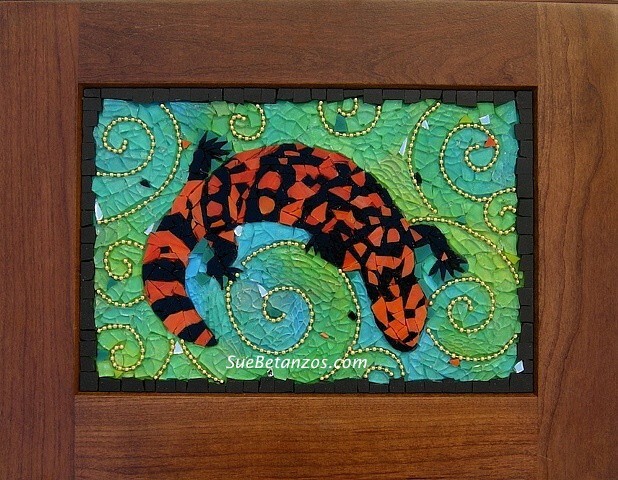 Stained Glass mosaic of Gila Monster, Gila Dream by Sue Betanzos. Jewel toned colors make the lovely Gila Monster even more vibrant and gem like. This mosaic had the honor of being selected and exhibited at the Tohono Chul Arizona Centennial Exhibit 2012 as part of Arizona's Centennial celebration. Glass, stained glass, beading and mirror are part of this mosaic. Contact me to Commission your own Gila Dream!